Luxury 4 bed 4 bath villa -exceptional sea views over Camps Bay beach and ocean. Upmarket 4 bedroomed villa with pool in garden. Spectacular sea and mountain views. The epitome of modern upmarket luxury living this villa offers guests the ultimate holiday experience. 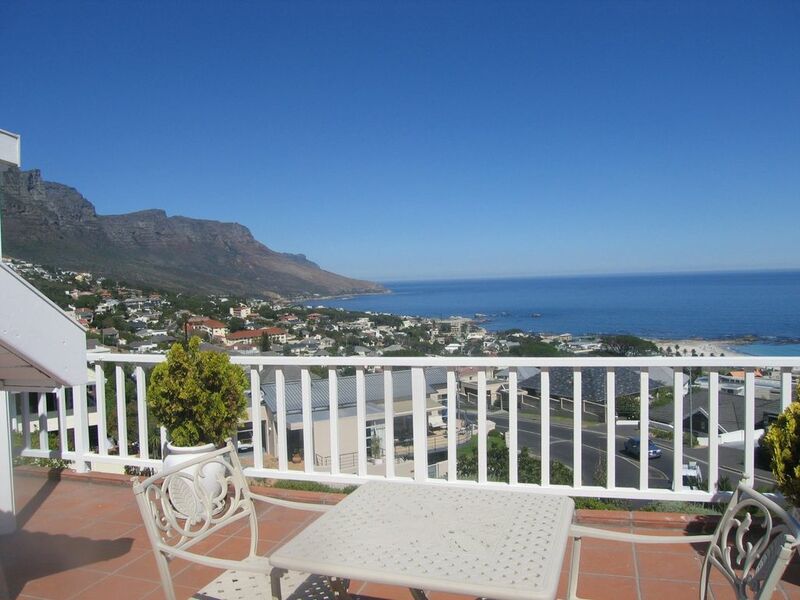 Set in a wonderful position off Geneva Drive in the sheltered Glen area with awe inspiring views over the Atlantic Ocean, Camps Bay Beach and the spectacular Twelve Apostles. The 360 views make sundowners on the patio or lunch around the pool an experience not to be missed. Spectacular sunsets! Tastefully decorated with a contemporary feel the villa lends itself to family living or to discerning guests looking for only the best Camps Bay has to offer. Comfortable to the extreme this well designed villa is spacious with a great flow to the patio and pool area. Four double bedrooms -three en suite and one separate bathroom. Spacious open plan living room and separate dining room. Flow to garden and patio overlooking pool and ocean Holiday living at its best with every home comfort. Wine Routes: Take a breathtaking journey through the wine lands of the Cape! This tour is certainly not just about wine tasting! In addition to visiting award winning wine farms, you will be taken on a cellar tour and witness the wine making process. You will also do cheese tasting and you will see Nelson Mandela’s former prison in Paarl, Victor Verster. You can walk through the historical town of Stellenbosch and will also visit the wine and food capital-Franschhoek. Century City – This is the largest shopping mall in The Western Cape. An extensive range of shops, restaurants. Be prepared to walk! Day trips : Travel along the spectacular coastline of the Peninsula through charming historical villages. Visit the meeting place of the two great Oceans and experience The Fairest Cape of all! Highlights of the trip include The Twelve Apostles, Clifton, House Bay, Chapman’s Peak, Ostrich Viewing, Cape of Good Hope Nature Reserve, Penguin Colony, Simons town, and Constantia. 3 bedrooms with en suite one with own separate bathroom. The property is clean and neat, located just 15 minutes walking distance from Camps bay beach and 15 minutes driving to Cape Town city center. We were pleased to start the day enjoying the views of the mountains and Ocean. It simply blows your eyes! We were like at home! Rob and Claire: thank you so much for your availability and please say Hi to Nomsy for keeping the house so clean. Thanks for your review and appreciate your looking after the villa so well. It was left in such a neat clean condition. We look forward to having you stay here again. Atholl Villa is a fabulous house & feels like home from the moment you unpack .Claire Hoard the property manager greeted us and handed over the keys and was on hand should we have needed her. The area feels completely safe & secure. The property is well maintained both inside & out. We were a party of 6 plus a 3 year old and found that there was plenty of room for everybody to lounge around. Sundowners with a large glass of the local chenin admiring the view, became custom rather quickly. I wouldn't hesitate to return. Thanks for your fabulous review. We like to make sure guests have everything they need during their stay. So pleased you enjoyed the magnificent sea views. Most famous for its fine white sandy beach, Camps Bay has been popular as a holiday destination for many years. Palm trees line the roadside next to the beach producing a fabulous holiday atmosphere with visitors. There are numerous pavement cafes and restaurants, some with unrivalled sea views which are always busy during the summer holiday months. Lions Head mountain as a backdrop and the Twelve Apostle chain, Camps Bay can be included within the most favoured worldwide coastal resorts.Clifton beach is very close by and there are lots activities on Camps Bay Beach during the summer months. In winter it is quieter but still has a holiday atmosphere. Easy to get to all the tourist places from Camps Bay. The V& A Watefront is only 15 minutes away. Golf: There is a 9 hole golf course nearby in Green Point and lots other 18 hole courses about 40 minutes away.